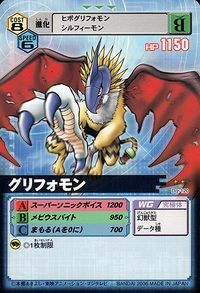 A fusion Digimon which possesses the head, wings, and forelegs of a Bird Digimon, and the body of a Beast Digimon with a snake-like tail attached to it. Although it is able to fly about the skies with its wings, it is said that it usually inhabits desert regions and mountain caves. Also, Griffomon's offensive power is extremely great, and because it makes sport of enemies with its keen movements, it is difficult to analyze any way to defeat Griffomon. To make the best use of those abilities, it serves as a guard defending against illegal penetrations of the Internet, and is used for the security of confidential information. Its Special Move is producing an extremely high-frequency sound wave, which obliterates the opponent's data structure (Supersonic Voice). Ultimate level, Mythical Beast type Digimon. n., From griffon, a legendary creature with the body of a lion and the head and often wings of an eagle. Anime/Manga Digimon Adventure V-Tamer 01: "Neo Attacks!!!" Supersonic Voice  スーパーソニックボイス Sūpā Sonikku Boisu Solo Roar/Supersonic Voice/Legendary Blade/SP Sonic Voice Produces an extremely high-frequency sound wave to destroy the opponent's configuration data. Bites the enemy with its tail. 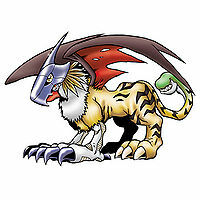 Griffomon was among the many Ultimate digimon who gathered to fight the D-Reaper. 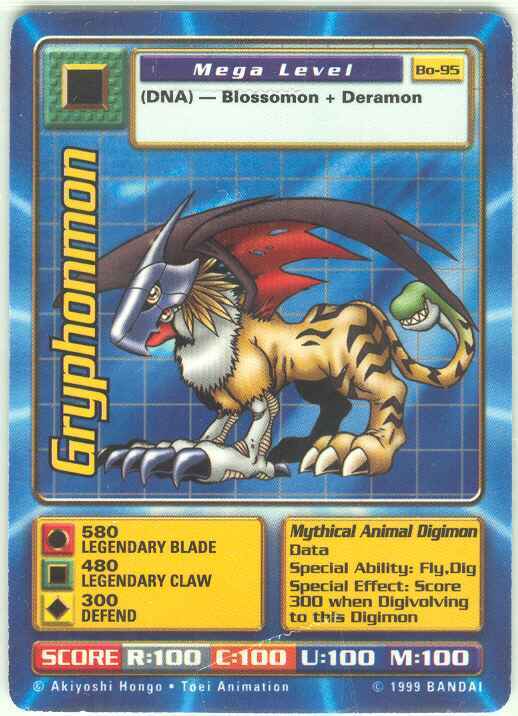 Griffomon was part of a group of Digimon which included 6 Airdramon, a Pteranomon, a Gran Kuwagamon and led by a Zanbamon which tried to fight the Royal Knights. Unfortunately, he was killed along with Pteranomon and Gran Kuwagamon by Lord Knightmon. Saiba Neo rode on a Griffomon's back during the attack on Holy Angel Castle. 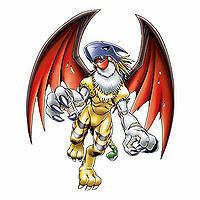 A Griffomon is part of the group defending Bagramon's Palace in Jupiter Zone. Can evolve from Piccolomon (0+ DP) or Delumon (0+ DP). An enemy digimon that can be encountered in Amaterasu Server's Noise Desert. 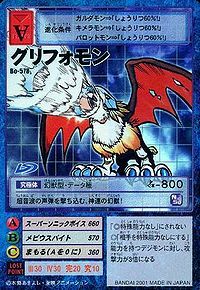 Griffomon is #330 Digimon and is a Mega-level, Speed-class, Bird-species with a resistance to the Wind element and weakness to the Thunder element. Its basic stats are 301 HP, 325 MP, 158 Attack, 140 Defense, 117 Spirit, 134 Speed, and 68 Aptitude. It possesses the Heroic Move, Silphy Air, Sleep Ward 4, and Critical 4 traits. Griffomon evolves from Garudamon. In order to evolve into Griffomon, your Digimon must be at least level 47, with 8000 Beast experience and 240 attack. 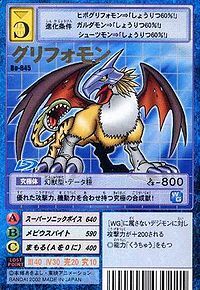 Griffomon can also jogress from DORUguremon and Tocanmon, if the base Digimon is at least level 41, with 7000 Beast experience, and 250 attack. Griffomon can be hatched from the Rainbow Digitama. Griffomon is a Ultimate-form Digimon with Data Attribute and its Elemental Attribute is Wind, it is quick attacker and family belongs to Wind Guardians and Nightmare Soldiers. Griffomon evolves from Blossomon over 25 Lv. It requires 6x Evoluters in order to unlock the evolution. It can be also be ridden, it requires x2 ModeSelectors in order to ride. Griffomon can be found in Infinite Ice Wall. 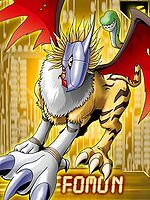 Griffomon is available as a Digimon Medal. Griffomon is a Jogress Digimon. It is obtainable by Jogressing Blossomon or Delumon with a compatible Digimon. 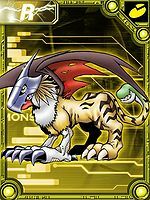 Griffomon is an unobtainable Leader Digimon. It taunts its enemy with its quick movements! This mythical beast flies at godspeed, firing its supersonic voice bullets! This ultimate composite beast combines both outstanding offense and maneuverability! 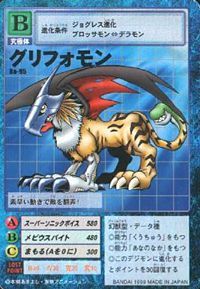 ↑ Digimon Tamers: "Janyu's Ark"
↑ In this episode Ruki's D-Ark displays this Digimon's name as Gryphomon, but she reads it as Gryphonmon. This page was last modified on 23 April 2019, at 00:56.